Paul McCartney is arguably one of the most famous musicians of the latter half of the twentieth century, mainly due to having been the bassist for the Beatles as well as half of the Lennon/McCartney songwriting duo that wrote most of their songs. Of course things started to get rough in 1968, and finally the Beatles broke up in 1970. McCartney, with his recently wed wife Linda, were solo until forming Wings with Denny Laine in 1971. Admittedly, while the Beatles are known to have a thoroughly good catalog, Wings was less consistent in the quality of the albums it produced. 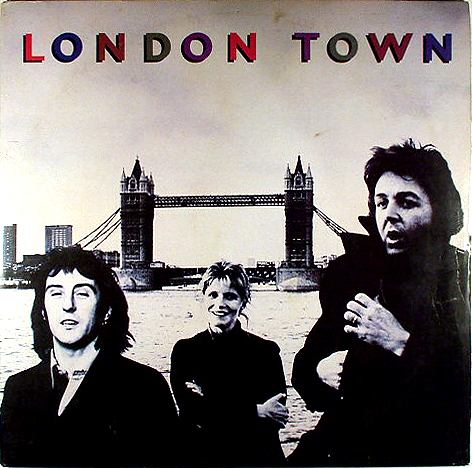 London Town was recorded in 1978, when Wings experienced troubles much akin to what the Beatles were going through a decade earlier, and as Wings broke up in 1981, London Town was one of the last albums to have been released by the band. My favorite song, by and far, is the title song, “London Town” with “Cafe on the Left Bank” coming in a close second. And as can be expected of many Wings albums, the best songs were the ones that were actually sung by Paul McCartney himself, and that thankfully constituted a majority of the album. Denny Laine was a very competent musician, but somehow I failed to really enjoy his songs as much as I did Paul’s. While admittedly not as terrorizing to the ears as Ono Yoko, Linda McCartney wasn’t as pleasing to listen to as her husband. Her “Girlfriend” did make me cringe a bit. At least Linda’s singing didn’t eat up half of the album like Yoko did with most of John Lennon’s. Finally, I was never a fan of synthesizer music. And that was precisely what the instrumental “Cuff Link” was, and I suspect that track was thrown in just to eat some space up on the record. Overall, I would still recommend London Town because of the better songs, but it’s definitely not as good as Band on the Run which Wings released five years earlier. At the same time, it’s not as bad as the weaker albums (which are pretty damn weak) that Wings made, so it’s still a winner overall. NOTE: I know this is the age of digital download, but this is one album where I definitely recommend getting your hands on the vinyl record.